Treating mange can be extraordinarily difficult for you and your pets. Luckily, DERMagic makes it easy. Our revolutionary four-step process is designed specifically for pets with aggressive skin conditions (like Demodex and Sarcoptic Mange, parasitical skin infections, and more). Once you take control of these microscopic insects, you and your pet are suddenly dealing with millions of dead mite larvae, which can eventually cause serious skin infections as their microscopic corpses stay embedded in your pets skin. This is why regular bathing is so very important. To cure demodicosis requires working in “layers”, just like if you were peeling an onion. First, you have to kill the mites. As the mites die, they release toxins, which turns into a nasty gel-like blob. You’ll first need to remove this top layer of tiny gelatinous decaying toxins and microscopic mite corpses using our four-step process. Because all these creatures are putting up a good fight in their final struggle, there's a good chance your pet will actually look worse than they did before treatment. They may feel twice as miserable due to all of those toxins and dead mite corpses being released into their system at once. Using a natural remedy helps kill the mites off more gradually rather than all at once. Our products are designed to help encourage healthy growth and a natural restore while it's doing it's initial job of destroying microorganisms that cause skin damage. This is why it’s so important to stay with natural remedies like DERMagic. When you start treating your pet and begin noticing infection spreading or hair loss increasing, take heart. When the immune system is compromised to the point of mites being able to invade, it means the yeast is also invading as your pet's body begins to overcompensate. Yeast is also what causes your pet's hair to fall out and their skin to turn black (also known as Black Skin Disease or Alopecia X). Reaction to Toxins: Your dog will probably experience increased itchiness due to the powerful toxins that the dead mites are releasing. They may appear to feel “flu-like” and will likely not want to eat or drink as much, they may sleep more, and they won't want to be bothered. They may be impatient. Please be patient and considerate with your pets while they recover. .
Mange May Spread: Mites are living beings and as soon as they are uncomfortable, they will do their best to make their host uncomfortable while seeking out a more comfortable position. If you only treat one part of your pet, the mites will simply move to another part that doesn’t expose them to light or sun or shampoo. This is why it’s important to take a holistic approach to the treatment. That means treating your pet inside and out. Change in Behavior Being infested with millions of microscopic creatures is unbearable at times and your pet is likely to be more sensitive to interaction. He may snap, or retreat from sight. Please remember that if you were as miserable as your pet, you would be awful to those you love as well. It is a temporary condition as much as it feels like it may go on forever. Increased Itchiness: Your dog will likely be more itching more than ever. The Skin Rescue Lotion will go a long way towards providing immediate relief. Use the lotion daily and bathe weekly with the Skin Rescue Shampoo Bar for best results. The DERMagic System is a revolutionary four-step process designed specifically for pets with aggressive skin conditions and owners who have tried everything, including numerous veterinary visits, topical and injected steroids and antibiotics, with little to no relief. Our formulations combine the healing qualities of natural ingredients like organic whole-leaf aloe vera gel, vitamin E, organic shea butter, and soothing essential oils (like Rosemary), with fast-acting florets of sulfur, which attack microbes and fungi and eradicate infection, relieving painful itching and redness. The DERMagic System comes with a 100% satisfaction guarantee, Now available in two money-saving options. Beyond DERMagic’s Essentials system, a nutritionally correct diet is the most important thing you can offer your pets. However, supplements may help support their immune system and make them a bit more comfortable while they’re recovering. Quercetin is known as “nature’s histamine”. This is a beneficial supplement for your pets and can be added to their food. 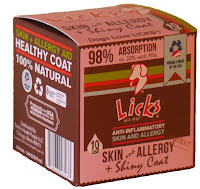 Licks Skin & Coat is an all-natural supplement that is individually packaged and tastes great. Their ingredients include Omega 3s sourced from wild-caught sardines and anchovies, Curcumin (principal curcuminoid of turmeric which acts as a general antioxidant), Inositol (naturally improves hair growth and stimulates the immune system) and Vitamin C.
NZymes is a powerful internal method of helping boost your pet's immune system, particularly when yeast is involved. 4. Your dog or cat will feel like they have a severe case of flu. Your pets will be miserably itchy, their immune system will attempt to overcompensate and actually result in being weaker as your pet tries to treat the exhaustion that goes along with the infection. They may become irritable, and with good reason - the harmful bacteria and yeast are poisoning them from the inside out. The inflammation will grow more severe, and your anxiety levels will become heightened. DERMagic works in layers. It not only kills off the toxic little creatures, but does it in a slower way so your dog is not as ill as he would be with chemical treatments like corticosteroids. These meds only treat the symptoms of itching, not the cause of the itching, and they will depress the immune system, making it harder for your pet to fight illness. Keeping your pet’s immune system up is critical during this juncture. You should make sure you’re feeding an all-natural, healthy, premium or (even better) a raw diet. Ridding your pet of mites is a process and it’s best done naturally. Killing these mites off a layer at a time will help limit the amount of toxins your pet will need to process. This also allows you to nurture your pet’s internal process while fighting the skin conditions. 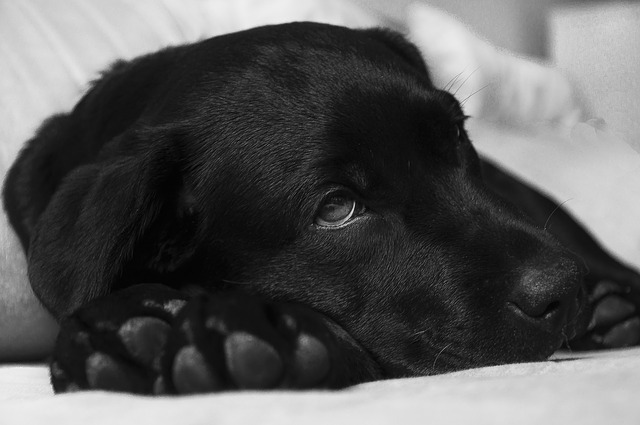 A mass kill can be dangerous for a pet that is already suffering from an immunity disorder. Killing the mites via natural methods will help limit this problem. The length of time it takes to cure your pet will vary between months or years, depending on a number of factors, including age, general health, immune function, and general health. Secondary infections can result and may take even longer to treat. The most important thing you can do is stay the course. Trust that the product is working and be patient with the treatment, and your pet’s mood swings and symptoms, until you are confident the dog or cat is free from the infection. Remember that your pet did not become infected with mange overnight. Demodectic mange preys on animals that are already immune-compromised. They become symptomatic because their immune system was not strong enough to stop mites before they had a chance to take hold. While your pet may at first appear to be more uncomfortable than ever before, it’s important to stay the course. You’re on the right track. This is not an overnight cure and it will take time, but in the end, your pets will be free from the problem. Don’t let your pet fall into a cycle of recurrence. You must continue to treat your pet long after the symptoms have abated. 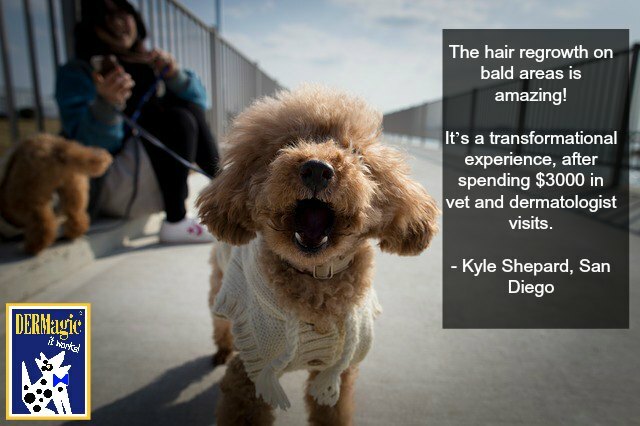 It takes time to rebuild an immunity and it will take time to have your pet's hair growth return. Be patient, the end of the cycle is within reach if you stay the course. We have thousands of testimonials that prove DERMagic works - even when everything else has failed (including numerous veterinary visits, topical and injected steroids and antibiotics). Our formulations combine the healing qualities of natural ingredients with fast-acting florets of sulfur, which attack microbes and fungi and eradicate infection, relieving painful itching and redness. I was just wondering about CBD without the THC. From what I’ve heard it is very good for all different sorts of pain relief especially in animals! A very cheap, natural supplement.